The folks who long ago brought you the Zip and Jaz drives (and a few other less memorable storage solutions) now introduce the candy-apple red eGo portable drive, and its gray, workhorse cousin, the eSATA. The USB 2.0 bus-powered eGo comes with 160GB and costs, by coincidence, $160. It's bundled with EMC's Retrospect software for backup, something you might not need if you run Vista (or if Leopard ever freakin' gets here). More uniquely, it has DropGuard technology, that protects data from accidental damage at drops of up to 51 inches. 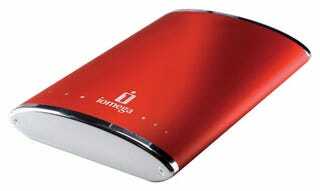 Iomega calls it a "fashion statement"—I'll just stick with cute little red hard drive. The 500GB eSATA drive is for the "pros" (aka Torrent luvrs): it's got a 3Gbps eSATA interface if you are lucky enough to have an eSATA connection on your PC. Hey, you might. If not, there's always USB 2.0. The eSATA lists for $210. Man, pricing on 3.5" 500GB drives are really coming down, but it looks like that eSATA card might set you back $70 or more.